In the long list of Pokémon movies, this is not the worst nor the best. There were many elements I thought were very computer game-ish; I could see that if they wanted to turn the movie straight into a game, there would be many scenes directly translated to that with all the jumping, fighting and moving around. Our main character Ash, Brock, May and Max are joined by a Marina Group, who put on a beautiful show with water and psychic Pokémon. None of the new characters stay as strangers and they become part of the story very nicely. Although the Pokémon Ranger Jack Walker is kind of annoying, he remains fairly professional and doesn’t ruin the whole thing. Pokémon Rangers as a whole are not explored all that much, when Ash - and especially May - end up being the big heroes. The music in the film was kind of disappointing. You could listen to it for a bit, but then it just seemed to repeat itself instead of remaining entertaining. The art was top notch again, although I’m not a fan of computer animation being mixed into the usual animation style - they just don’t fit together that well. The plot was short, making the movie feel slightly too long. It wasn’t boring, though, and remained quite well balanced. It also captured some good, strong emotions of taking care of someone and then having to let them go. I wouldn’t resist watching this again, but the story was a bit weaker than in the best of Pokémon movies I’ve already seen. This was the cutest Pokemon movie ever. Pokemon Rangers are set out to protect Manaphy, "the prince of the sea." After it hatches, it sees May as its mother, thus making a strong and painful bond for them. After evil comes to capture Manaphy, Ash is the hero once again. For the kids that don't know this generation, this will show how Ash has come along. For those that have seen this, couldn't hurt to watch it again! 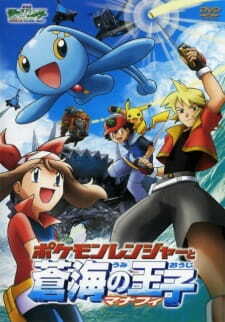 Manaphy: The Movie, or if you're fond of long winded titles, Pokémon Ranger and the Temple of the Sea, is the fourth and last film in the Pokemon Advance series. While the film series continued onward with annual releases under a slightly different name, this was the last we saw of May and Max. The first Advance film gave Max some focus, but both characters were generally reduced to supporting roles. Luckily for May, Pocket Monsters Advanced Generation the Movie: Pokémon Ranger and the Prince of the Sea: Manaphy decided to focus on her. And lucky indeed she is, because the fourth Advance film is the only of the four I can consider good without any doubts. While the slapstick antics of the titular ranger, Jack, did initially turn me off the film, they're used sparingly. Phantom and his pirate crew border on the ridiculous as well, but just like Jack, they're used in moderation and in mostly good taste. Mostly. One of the major things that make this film stand out from most Pokemon sequels is the creation of interesting side characters. The family Ash and company come in contact with this time aren't exceeding strange or special. They feel like normal people and as normal people, they have small quirks that flesh them out as unique - the way they dress, talk, walk and values they spout. The film succeeds at painting the relationships of supporting cast as real and fine dialogue makes them interesting enough to follow. Their distinct "house" is given its own visual identity, as well. Because of this, film successfuly indulges into 40 minutes of set up and casual character building. Handled wrongly, Manaphy could have ended up as an annoying baby and a catalyst for many frustrating moments. This doesn't happen. In the film, Manaphy bonds with May, and although May isn't interesting here as she is in the fourth season of the regular Pokemon show, she can take the spotlight just fine. While the film is plot driven, a large chunk of the middle half is spent on a journey. This time is spent focusing on the relationship between May and Manaphy and I'm happy to say - this relationship makes the movie shine in a few moments. Accompanied by some quite sophisticated dialogue for a Pokemon film - at least for a later Pokemon film. Anyway, these scenes are the best that this movie has to offer. Some standout scenes are Manaphy's search for May's scarf and the exchange between Jack and Ash with May joining in later. On the less positive side, this migrant family of circus entertainers has enough money for top tier sea equipment, boats and submarines. In the movie they proceed to destroy these vehicles and you can't stop and wonder - how rich do they have to be not to mention the loss? The last third of this film, features a supernatural sea temple and while I've had my rants regarding vague magic in Pokemon before, this one's not a thorn in my side. "A legendary did it" is not the best explanation, but considering how the temple was used in the film, it gets a pass. Especially because the whole creation is seen as fragile. It decays and sinks. The temple is subservient to cause and effect. It's not just a cool magic thingy. In the last act, the film serves us a nice meal - Ash acting heroic. There's some neat action and Ash, who usually spouts exposition while his pokemon do all the work, plunges right into the action and saves the day. While the ending could certianly do with some more May, Ash makes it worthwile. Bravo Ash, this marks the first time since the Mewtwo movie that you displayed agency. This was another good Pokemon movie. The plot was okay. It started out as a cookie-cutter "steal this Pokemon" plot but things got much more interesting in the second half with the whole underwater temple business, so it was overall fine. There were several other positive aspects as well. There was a lot of funny bits, such as the foreshadowing of Pokemon Diamond and Pearl, and Phantom's "there are two kinds of people" running gag. The fight scenes were, as usual for the series, very well-done, and there was a nice amount of very well-done emotional and cute moments surrounding May and Manaphy. Overall, another good movie, one any fan should enjoy.